As a current or potential Jeep Wrangler owner, one item that is more than likely an utmost priority of yours and one of the main reasons you chose a Wrangler in the first place is for doorless cruising. The question is, though, is it technically legal? Will you get pulled over on the highway or anywhere else for enjoying the breeze that a trivial window simply won’t provide? 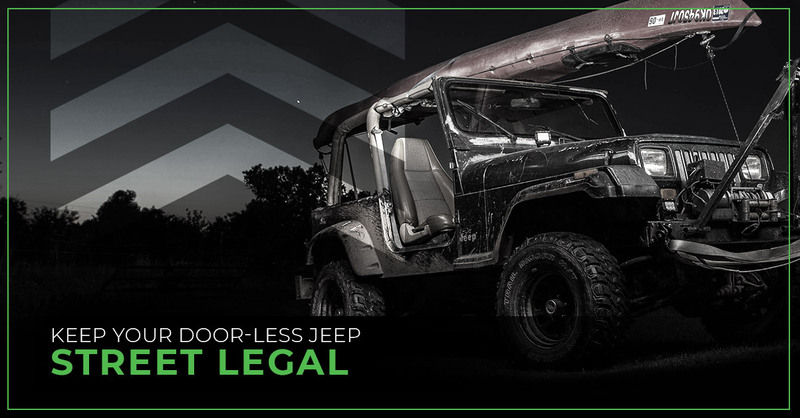 It is completely legal to remove your Jeep doors and drive on public roads without them, as long as you are sure to take care of a few minor things first. When you remove your Jeep doors, you will also be removing the mirrors. In order to remain in compliance with state laws, you must re-attach your mirrors. All states require that a vehicle have a certain number of mirrors in order for the driver to see around and behind their car. Because your side-view mirrors are attached to your Jeep doors, you must find another way to attach mirrors to your Jeep in order to stay safe and abide by the rules of the road. Some states specify that a vehicle must have at least one side mirror and rear view mirror, while others simply state that you must have “two mirrors” of any sort. There are a few states that go by their own more specific rules. Ohio, for instance, is the only state that specifically states that three mirrors are required. States like New York, Maryland, Kentucky, and Kansas all state that a left side view mirror and interior rearview mirror must be installed in order to be in compliance with their state laws. Michigan and Nevada’s laws only state that mirrors are necessary if a vehicle is over a certain size. Missouri doesn’t require any mirrors for vehicles made before 1968 (for you classic Jeep CJ owners), but any vehicle manufactured after then must have the same amount of mirrors as provided initially from the factory. If you want to learn more specifics about the laws of your state or the state you plan to visit with your Jeep, see the entire list of mirror laws by state. Whatever model of Jeep Wrangler or CJ you have, there are a multitude of aftermarket Jeep mirrors available for purchase in stores and online. You can choose to either buy aftermarket mirrors that install into the door hinges or ones that use brackets to attach the mirrors to a section of the windshield or body paneling. Here is one aftermarket Jeep mirror package we recommend. These aftermarket mirrors are very simple to attach and detach with a few bolts, and there are a surprising number of YouTube videos out there to help guide you through the process for your first attempts. We recommend installing them in the same position as the stock mirror, as this is where Jeep determined the ideal height and location to be for the best angle of driver visibility. You can do this by mounting bracketed mirrors to the side panel of your Jeep at the same height level that your stock mirrors would normally reside. Another common relocation point, though, is within the Jeep door hinges. This is one of the least expensive options and also provides a quick method for installation and removal for when you’re ready to put your doors back on. The main issue with this option, however, is that the side mirrors are much lower than the stock ones that come attached to your Jeep doors. If you’re looking for the most simple way to comply with state laws, this is your best route, but it comes with less visibility and more concerns at highway speeds as wind noise and vibration are common. Another popular option among offroaders is the windshield pillar location for replacement Jeep mirrors. These do a much better job at positioning the mirrors in a higher spot that is more in line with the original factory mirror location. Many of these mirror options are also available in a quick-release form with a base bracket that is secured to the windshield pillar frame bolts. 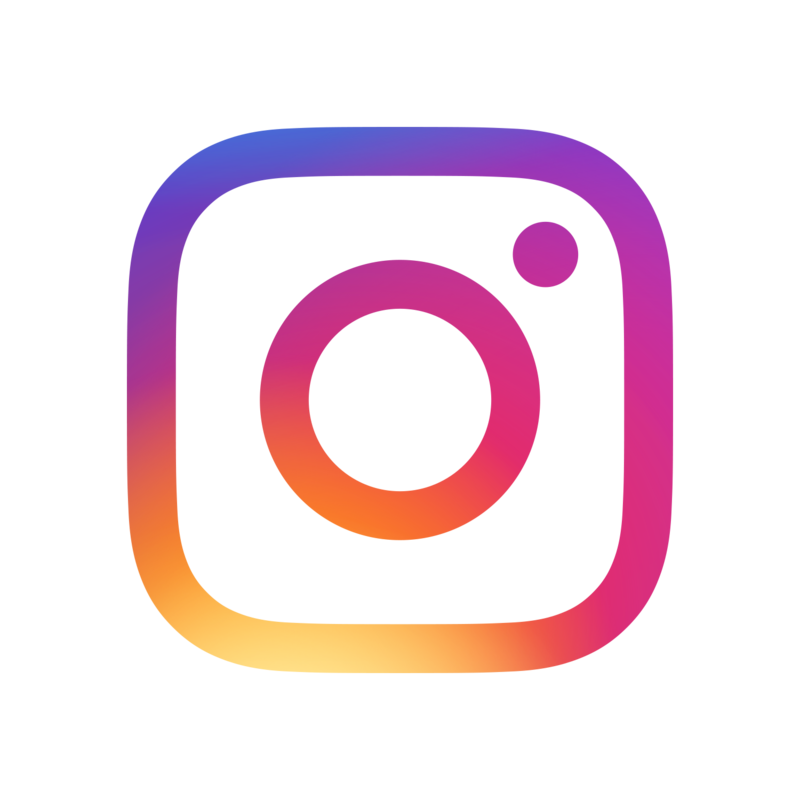 The initial installation is rather seamless, and you still have the option to quickly remove and reinstall the door hinge system. While it may seem like the windshield pillar mirror option is the best of both worlds, it still comes with some drawbacks. Similar to the door hinge mounting, there can be a significant amount of wind noise and vibration since the mirrors extend so far away from the body of the Jeep. They also come with a more hefty price tag in most cases. Another viable option for your replacement mirrors to remain street legal is on a pair of tube doors. Most Jeep tube doors allow for a direct relocation of the factory mirrors. While you can save money by not having to buy replacement mirrors, you would still have to buy tube doors, which is even more costly. If you plan on using tube doors regardless, then this might be your best option. Now that you know you can take your doors off your Jeep and cruise with the assurance that you are street legal, you need to have a simple and efficient way to hang and store your Jeep doors for those beautiful summer days! 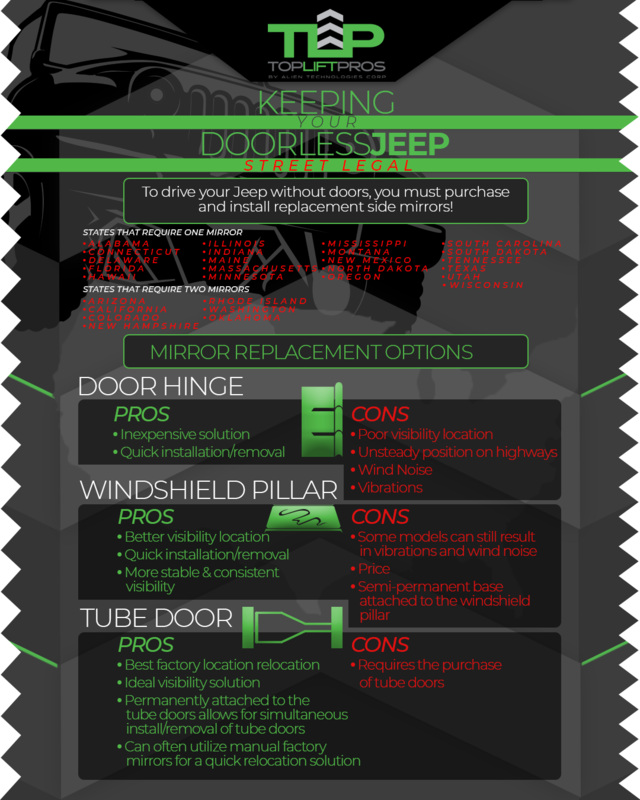 With Top Lift Pros Jeep Store-A Door, getting your doors off and safely stowed away is now easier than ever before. Don’t settle for your typical, run-of-the-mill Jeep door hangers that require wall mounting and risk damaging your Jeep doors or garage walls. With our Jeep door hanger solution, there is no more drilling holes in your wall or having to choose before you go on an off-road adventure whether to keep your doors on or leave them behind and risk the weather. What are you waiting for? Order your Jeep Store-A-Door today before other Jeepers beat you to the punch!